The 1901 Michigan Wolverines football team was an American football team that represented the University of Michigan in the Western Conference during the 1901 Western Conference football season. In their first year under head coach Fielding H. Yost, the team compiled a perfect 11–0 record, outscored its opponents by a combined total of 550 to 0, tied with Wisconsin for the Western Conference championship, and defeated Stanford by a 49 to 0 score in the inaugural Rose Bowl game, the first college bowl game ever played. The 1901 team was the first of Yost's famed "Point-a-Minute" teams, so named for their high scoring offense, from 1901 to 1905, Yost's Michigan teams compiled a record of 55–1–1 and outscored their opponents by a combined score of 2,821 to 42. Although no system was in place during this era to determine a national champion, the NCAA recognizes as official certain selectors who have sought to establish historic national championships. Three of the five official selectors, the Helms Athletic Foundation, the Houlgate System, and the National Championship Foundation, recognize the 1901 Michigan team as the national champion. The 1901 team holds the distinction of having won the first national championship claimed by the Michigan Wolverines football program. Several players from the team received individual honors. Fullback/end Neil Snow was selected as a first-team player on Caspar Whitney's 1901 All-America Team. Halfback Willie Heston was selected as a third-team player on Walter Camp's 1901 and 1902 All-America Teams and as a first-team player on Camp's 1903 and 1904 All-America Teams. In addition, five Michigan players received first-team honors on the 1901 All-Western college football team. They are Snow, Heston, quarterback Boss Weeks, tackle Bruce Shorts, and fullback/halfback Everett Sweeley. The team captain was tackle, Hugh White. Four individuals associated with the team have been inducted into the College Football Hall of Fame, they are Yost, Snow, Heston, and assistant coach Bennie Owen who later went on to fame as the head coach at Oklahoma. The 1900 Michigan team compiled an overall record of 7–2–1 under first-year head coach Langdon Lea. However, the season was considered a disappointment as the Wolverines finished in fifth place in the Western Conference with a 3–2 record against Western Conference opponents and a loss to rival Chicago; in January 1901, coach Lea resigned as Michigan to accept a position as the head football coach at Princeton. Fielding H. Yost took over as Michigan's coach in 1901. Fielding Yost was hired as the new coach at Michigan in the spring of 1901, he traveled to Ann Arbor in early April to evaluate the talent pool with which he would be working. After sizing up the players, Yost asked for early practice in the fall. Yost left California in late August and arrived in Ann Arbor on September 4. On arriving in Ann Arbor, Yost said that he was "here to stay until Michigan secured the western championship." Several starters from the 1900 team returned to Michigan to participate in the 1901 team, including Boss Weeks, Everett Sweeley, Curtis Redden, Hugh White (the 1901 team captain), Ebin Wilson, Bruce Shorts, Neil Snow, Arthur Redner, and Albert Herrnstein. The strength of the returning roster led to confidence in the 1901 team's prospects. On September 9, 1901, Yost and captain White gathered a small squad of men at Whitmore Lake; the squad grew over the next two weeks to nearly 20 players. Training continued for nearly two weeks, and "cold baths in the lake soon toughened the men." Yost worked with the players on the rudiments of the game and later recalled that, by the time they returned to Ann Arbor, "we had worked the men down into fairly good training for football work." In addition to training, Yost spent time at Whitmore Lake evaluating his talent to fit particular positions, he soon shifted players around. He moved the team's only All-American, Neil Snow, from end to fullback on offense, keeping him at right end on defense. Yost moved Arthur Redner from center to right guard and George W. Gregory to center. He also brought Willie Heston with him from California at the halfback position. In a 1952 letter, Heston later recalled: "He brought to Michigan an entirely new brand of football, not known in the Big Ten nor to the Middle West. Particularly, that was true of his offense. Speed and more speed was continually emphasized. 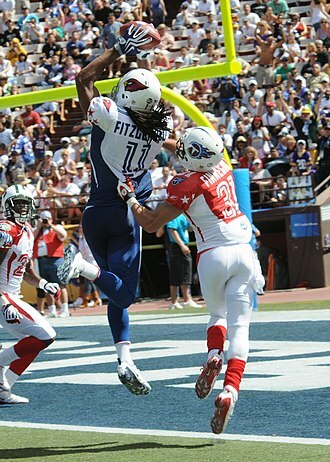 Boss Weeks was instructed to call his signal for the next play while the team was getting up from the last play." "The work at the Lake was a review in the first principles of the game, a thorough study and quiz upon the rules – something which had been sadly neglected in former years. It was also the first step in the conditioning of the team. "I am not sure whether I ought to play football or not. ... I put on Tom's suit one night and went down to the field to meet Yost and a few other men, they made me run around the track a couple times to try my wind. Then they rolled me around the ground and sat on me a while. I did not understand the necessity of all they did to me, but the boys say every great player must begin that way." On September 24, 1901, the Michigan Daily-News correctly predicted that "Hurry up" would become the future title of Michigan's new coach, Fielding Yost. Yost brought halfback Willie Heston with him from California in 1901. Michigan opened the 1901 season with a 50–0[n 1] win against Albion College, a team that won the Michigan intercollegiate championship in 1900. The game was played in 20-minute halves at Regents Field in Ann Arbor on September 28. Michigan scored nine touchdowns (worth five points each in 1901), including three by Hugh White, two by Walter W. Shaw, and one each by Neil Snow, Willie Heston, Bruce Shorts, and Everett Sweeley. Shaw also kicked three goals from touchdown with Herb Graver and Sweeley adding one each. Heston appeared in his first game for the Wolverines as a substitute for Shaw at left halfback; in its account of the game, The Michigan Alumnus described Heston as a "stocky Californian" who "proved a whirlwind in bucking the line." Heston's first touchdown as a Wolverine came on a defensive take-away described as follows: "Once when Albion had the ball on her 25-yard line, Heston broke through between guard and center, got possession of the ball before it left the quarter back's hands, and made a touchdown." Joe Maddock was the only Albion player to gain ground; he transferred to Michigan in 1902. Walter W. Shaw was the starting halfback for the first two games in 1901. Michigan starting lineup was Curtis Redden (left end), Hugh White (left tackle), Dan McGugin (left guard), George W. Gregory (center), Ebin Wilson (right guard), Bruce Shorts (right tackle), James Knight (right end), Boss Weeks (quarterback), Walter Shaw (left halfback), Everett Sweeley (right halfback), and Neil Snow (fullback). "Two men, Sweeley and Heston, constantly won the plaudits of the rooters by their long gains around the ends. Sweeley is fleet, and he kept his feet in a way that reminded the wise ones of McLean's remarkable performances. Heston proved himself the ground gainer that he has given evidence of being during the daily practices." In its coverage of the game, the Alumnus also noted that Michigan's new coach Yost "refuses to have a man on the field who [is] 'yellow' or who is not willing to work and to take his fair share of knocks." The Alumnus concluded: "If Michigan has a winning team, it will be because some of the enthusiasm of her coach has been transferred to the men." Michigan's starting lineup was Curtis Redden (left end), Hugh White (left tackle), Dan McGugin (left guard), George Gregory (center), Ebin Wilson (right guard), Daniel Woodward (right tackle), James Knight (right end), Boss Weeks (quarterback), Everett Sweeley (left halfback), Walter Shaw (right halfback), and Neil Snow (fullback). On October 12, Michigan defeated Indiana, 33–0, at Regents Field in a game of 25- and 20-minute halves, the game was played on a field that had undergone steady rain for 24 hours and had been reduced to "a sea of mud." The field conditions kept Michigan from getting its "fast play into correct motion". Nevertheless, Michigan allowed Indiana a first down only once and was only once forced to punt. Aside from the field conditions, Michigan's scoring was slowed by three fumbles and eight holding and offsides penalties. The highlight of the game was a 75-yard punt return by Boss Weeks. Michigan scored six touchdowns, including two each by Bruce Shorts and Willie Heston and single touchdowns by Neil Snow and Walter W. Shaw. Shorts added three goals from touchdown. Following the win over Indiana, the student newspaper, The Wolverine noted: "The 'Varsity showing was most satisfactory. Against a heavier team, on a slippery field which was all in favor of the visitors and directly opposed to our style of play, the 'Varsity was not found wanting and turned victory into a fight for big scores. Even the most optimistic did not look for such a large score, with the elements against us, the smiling, yet earnest face of Coach Yost has become a favorite feature at the games. His success as a coach has already been demonstrated, and every Michigan man is proud of him as an athlete, as a coach and as a man." Michigan's starting lineup was Curtis Redden (left end), Hugh White (left tackle), Dan McGugin (left guard), George Gregory (center), Ebin Wilson (right guard), Bruce Shorts (right tackle), Albert Herrnstein (right end), Boss Weeks (quarterback), Willie Heston (left halfback), Everett Sweeley (right halfback), and Neil Snow (fullback). On October 19, Michigan defeated Northwestern by a score of 29–0 at Regents Field in front of a crowd of 3,000 persons, the victory was considered particularly important as Northwestern had been considered "a strong aspirant for western championship honors". In a game of two 25-minute halves, Heston scored three touchdowns and had runs of 55 and 45 yards. Left halfback Willie Heston scored three touchdowns, with Neil Snow and Walter Shaw scoring one each. Bruce Shorts added four goals from touchdown. Northwestern's longest gain was six yards, the only threat to Michigan's goal came in the second half when Willie Heston fielded a kickoff and tossed to Everett Sweeley. Northwestern took over at the ten-yard line and moved it by the "tandem play" to the two-yard line. Yost later recalled the impressive play of his team in preventing Northwestern to score: "The defense at this point was as good as I have ever seen. Northwestern could not advance a foot. When the ball was held for downs and Michigan had again obtained possession, our goal line had passed its only danger of the season." The Pittsburgh Press described the game as follows: "Just to show her superiority during the last few minutes of play, Michigan, put in an all substitute line. The Michigan defence was impregnable and her offensive work grand." Michigan's starters in the game were Curtis Redden (left end), Hugh White (left tackle), Dan McGugin (left guard), George Gregory (center), Ebin Wilson (right guard), Bruce Shorts (right tackle), Albert Herrnstein (right end), Boss Weeks (quarterback), Willie Heston (left halfback), Everett Sweeley (right halfback), and Neil Snow (fullback). Albert Herrnstein scored five touchdowns against Buffalo and six touchdowns against Beloit, and he later coached the Ohio State football team. On October 26, Michigan defeated the University of Buffalo by a score of 128–0 at Ann Arbor. Michigan scored 22 touchdowns in the game, five by Albert Herrnstein, four each by Neil Snow and Arthur Redner, three each by Willie Heston and Everett Sweeley, two by Curtis Redden, and one by Bruce Shorts. Shorts also had 18 goals for touchdown, the game was scheduled to be played in 30-minute halves, but Buffalo's coach asked at halftime that the second half be reduced to 20 minutes, and so the game was limited to 50 minutes of playing time. The Detroit Free Press noted that Michigan scored more points against Buffalo than it had during the entire 1900 season, averaging more than two points per minute played and a touchdown every two minutes. "[T]he score of to-day's game was one of the most remarkable ever made in the history of football in the important colleges. Only two scores are recorded in American where a victory was won in more decided style, these occasions were when Stevens Institute beat the College of the City of New York by 162 to 0 at Hoboken, N.J., in 1885, and when Harvard beat Exeter by 158 to 0 at Exeter, Mass., in 1886." After the game, Buffalo's Coach Gordon said Michigan was "one of the most wonderful teams he ever saw," and added, "Michigan can defeat any team in the East." Buffalo had defeated the team from Columbia University, one of the stronger teams in the east, by a score of 5–0 earlier in the season. The 1901 Columbia team defeated Eastern "Big Four" power Penn, 11–0, and narrowly lost a game to Yale, 10–5. Several newspapers used the Buffalo game as a point of reference in assessing the strength of Michigan's 1901 team. The Pittsburgh Press reported that Michigan's big victory over a "fairly strong" Buffalo team "shows that Michigan has a remarkable team." The Daily Review from Decatur, Illinois, observed: "Considering the fact that Buffalo trimmed Columbia rather easily, making a larger score against the college than did Harvard or Yale, there seems some justice in" Coach Brown's comments that Michigan could defeat Harvard, Yale or Princeton. The Adrian Daily Telegram opined: "Michigan defeated Buffalo 128 to 0, which clearly demonstrates that she can bump the big eastern four without much fear of disaster." In 1916, Coach Yost shared his recollections of the Buffalo game with Big Bill Edwards: "Buffalo University came to Michigan with a much-heralded team, they were coached by a Dartmouth man and had not been scored upon. Buffalo papers referred to Michigan as the Woolly Westerners, and the Buffalo enthusiasts placed bets that Michigan would not score." The score at the end of the first half was 65 to 0. About fifteen minutes after the second half had started, Yost discovered a Buffalo player, Simpson, "on Michigan's side of the field, covered up in a blanket." Yost was curious and asked, "Simpson, what are you doing over here? You are on the wrong side." To which, Simpson replied, "Don't say anything. I know where I am at, the coach has put me in three times already and I'm not going in there again. Enough is enough for any one. I've had mine." The Wolverines defeated Pop Warner's Carlisle Indian team, 22–0, in a game played at Bennett Park in Detroit on November 2. The game drew a crowd of 8,000 spectators, "[t]he largest crowd that ever turned out to a football game in Michigan." Bruce Shorts led the scoring with 12 points on a touchdown, a field goal, and two goals from touchdown. Eben Wilson and Willie Heston also scored touchdowns. Carlisle in 1901 also played several of the major Eastern teams, losing a close game to Penn (14–16), and also losing to Cornell (0–17) and Harvard (0–29). Accordingly, the Michigan-Carlisle game triggered a debate as to whether Michigan's football team was as strong as Harvard and the other leading teams of the East. Carlisle played the Michigan game without its star tackle, Martin Wheelock, who was injured one week earlier against Harvard. Michigan, too, played without a key player, Curtis Redden. After the game, Pop Warner, who had predicted a victory before the game, asserted that his team was depleted by injuries and opined that Michigan was not as strong as Harvard. Following Warner's claim, the Detroit Free Press published a position-by-position analysis purporting to show that Warner used his best team against Michigan. The New York Times pointed to the Carlisle game as evidence that Michigan's remarkable season was not limited to small institutions. Coach Yost later wrote that he believed Michigan would have won by an even larger score if Redden had not been injured. Michigan's convincing win over Carlisle, and its wins over Buffalo and Chicago, led the Times to conclude that a game between Michigan and one of the "Big Four" teams of the East "would be a conflict well worth seeing and productive of interesting and possibly startling results." On November 9, 1901, undefeated Michigan faced an undefeated Ohio State team that had allowed opponents to score only five points in its five previous games, the 1901 game was the third meeting in what would become the Michigan–Ohio State football rivalry, with the two teams having played to a scoreless tie in their prior match in 1900. Michigan won the 1901 game, 21–0, at Ohio Field in Columbus, Ohio, in front of a crowd of approximately 4,000 persons. A special train carried 375 Michigan students to the game on the Ann Arbor and Hocking Valley railroads. Ohio State held the Wolverines to their lowest point total of the 1901 season. Prior to the game, the head coaches argued over the length of the game, Yost insisting on regulation halves of 30 minute and Ohio State's John B. Eckstorm insisting that the first half be limited to 25 minutes. When the umpire threatened Ohio State with a forfeiture, coach Eckstrom agreed to play regulation halves of 30 minutes. Michigan scored three touchdowns in the first half. Left tackle Hugh White scored the first touchdown on a two-yard run with Bruce Shorts kicking the goal from touchdown to give Michigan a 6-0 lead. Michigan's second touchdown was scored by left halfback Willie Heston on a 40-yard run. Fullback Neil Snow scored the third touchdown of the first half and also scored the only touchdown of the second half. The Detroit Free Press noted that Ohio State's players sought to slow the pace of Michigan's "hurry up" style of play. The paper noted: "On almost every scrimmage some Ohio man would stretch out on the ground and take his full time, this playing for wind was so apparent that the Michigan players finally burlesqued it. The Ohio men could not stand the gaff, and their doctors and trainer ran more yards than both teams put together." After the game, coach Yost commented on Ohio State's tactic: "Their laying down for time took much of the vim out of our team, and rested their tired out players." On November 16, 1901, Michigan faced its traditional rival in Amos Alonzo Stagg's University of Chicago Maroons football team. Chicago had won three of the prior four matches, including a 15–6 victory over Michigan in 1900. Coach Yost noted, "I knew long before I came to Michigan of the great rivalry existing between this University and the University of Chicago, it was my desire to win this game above all others." The 1901 game was played in 35-minute halves at Regents Field in front of one of the largest crowds that ever attended a game up to that time in Ann Arbor. Michigan won the game, 22–0. Michigan's first touchdown was scored by fullback Neil Snow with Bruce Shorts kicking for the goal after touchdown, the second touchdown was scored at the 9-minute mark in the first half by left tackle Hugh White on a "mass play" on Chicago's left end. Shorts missed the kick for goal from touchdown; in the second half, Shorts scored Michigan's third touchdown after 5:45 had been played in the second half but missed the kick for goal as Michigan extended its lead to 16–0. White scored Michigan's fourth touchdown and Shorts kicked goal at the 7:30 mark of the second half. Michigan's defense held Chicago to three first downs, never allowed the Maroons into field goal range, and forced 11 punts while the Wolverines punted only once. Despite the win, Coach Yost was disappointed with the low point total accumulated by his team and publicly stated that "we would have scored many more points on Chicago if the field had been dry." Yost described the impact of the weather on his team as follows: "Much to our disappointment the game was played on a muddy field in a snowstorm, and the work of our backs was seriously handicapped, the Chicago team was not to the same extent handicapped by reason of the fact that it did not rely upon speed to advance the ball. . . . End-running was impossible, and we were compelled to make our gains by line-bucking which is a slow process . . ."
Right tackle Bruce Shorts scored 23 points against Buffalo, 19 points against Beloit and 25 points against Iowa. Michigan played its final home game on November 23 and won, 89–0, over Beloit College, the game was played in 30-minute halves at Regents Field in Ann Arbor. Michigan scored 15 touchdowns, six by Albert Herrnstein, three by Neil Snow, and single touchdowns by Shorts, Heston, White, Graver, Sweeley and Redner. Shorts also scored on 14 goals from touchdown, giving him 19 points, the game was played on a wet field that was "practically a pond in the centre, filled in with sawdust before the game started." Because of the field conditions, Michigan was not able to execute its end runs and relied principally on "line bucking." Right end Albert Herrnstein scored six touchdowns for 30 points, including two kickoff returns for touchdowns in the second half. Coach Yost later recalled the scene on the field after one of Herrnstein's runs: "Once when Herrnstein made a long run for a touchdown I remember of seeing four Beloit players stretched on the ground in a line where they had made useless efforts to stop him." Right tackle Bruce Shorts scored a touchdown and kicked 14 extra points for 19 points. Fullback Neil Snow added three touchdowns for 15 points, and single touchdowns were scored by Heston, White, Graver, Sweeley and Redden, the Beloit team managed to gain the five yards required for a first down on only one drive late in the game. Beloit's one first down came on a fake kick followed by a run of 15 yards—the largest gain made by any team against Michigan in 1901. The New York Times reported: "The strong team from Beloit was unable to do anything against the Ann Arbor men." Michigan closed its regular season schedule on Thanksgiving Day, November 28, with a 50–0 win over the University of Iowa in front of a crowd of 10,000 spectators at West Side Park in Chicago. The New York Times reported that "Michigan scored almost at will" and "outclassed" a "sturdy, plucky" Iowa team. Willie Heston and Bruce Shorts scored four touchdowns each for Michigan and "played a spectacular part for the Wolverines." Shorts added five successful extra point kicks giving him 25 points in the game. Neil Snow also scored a touchdown for Michigan. Michigan's starters in the game were Herb Graver (left end), Hugh White (left tackle), Dan McGugin (left guard), George Gregory (center), Ebin Wilson (right guard), Bruce Shorts (right tackle), Albert Herrnstein (right end), Boss Weeks (quarterback), Willie Heston (left halfback), Everett Sweeley (right halfback), and Neil Snow (fullback). After the conclusion of the 1901 football season, Michigan, was invited to play against Stanford in the first Rose Bowl Game in Pasadena, California. Michigan won the game on New Year's Day 1902 by the score of 49–0. Neil Snow scored five touchdowns. The players that traveled to California were starters, Hugh White, Curtis Redden, Dan McGugin, George Gregory, Bruce Shorts, Albert Herrnstein, Boss Weeks, Everett Sweeley, Willie Heston, and Neil Snow, and substitutes Arthur Redner (back), Benjamin Harrison Southworth (guard), James E. Forrest (tackle), and Paul J. Jones (back). 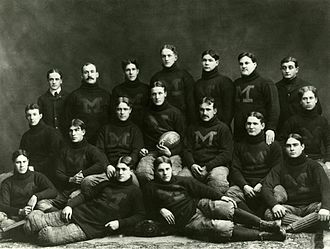 The 1901 Michigan team was the first of Yost's "Point-a-Minute" teams, so named for their high scoring offense, from 1901 to 1905, Yost's Michigan teams compiled a record of 55–1–1 and outscored their opponents by a combined score of 2,821 to 42. After the first four games, a Boston newspaper noted that Michigan "has scored an average of one point for every minute of play." The race to continue the point per minute scoring remained a topic of reportage for the remainder of the season, after six games, the Wolverines had scored 319 points in 280 minutes. At the end of the regular season, Michigan had fallen slightly short of the point-a-minute mark with 501 points in 540 minutes. All-American Neil Snow scored five touchdowns in the 1902 Rose Bowl. "An equally strong element, and one many are apt to overlook, was the work of Keene Fitzpatrick. Consider a team training nearly four months, without a man going stale, and but one injured so that he had to be taken out of the game! Then in addition a trip of nearly 3000 miles, from a climate where the thermometer registered 10 degrees below zero, into one of summer weather, and eleven men playing through an entire game and finishing it with faster and stronger play than at the beginning! Such were the results achieved by our trainer. ... Too much praise cannot be given him." For its impressive average of 50 points per game on offense and eleven games of scoreless defense, the 1901 team has been recognized as one of the greatest college football teams of all time. Snow was selected as an All-American by Caspar Whitney for Outing magazine, and four Wolverines were selected for the All-Western team: Snow (fullback/end), Heston (halfback), Boss Weeks (quarterback), and Bruce Shorts (right tackle). Everett Sweeley from Iowa was considered one of the best punters in the country in 1901. At the end of the 1901 season, team captain Hugh White wrote: "The fall of 1901 will go down in the history of Michigan athletics, not only as the most successful football season the University has ever had, but also as establishing the most wonderful and unique record in the history of the game." A summary of the accomplishments of the 1901 Michigan team was published in the 1902 University of Michigan yearbook under the title "Yost's Soliloquy." The accomplishments of the 1901 team included the highest number of points ever scored in a single season by a recognized team, the punting of Everett Sweeley was also an important element in Michigan's success in 1901. Sweeley was regarded as "the best punter in the country." Ten men, all but the center, carried the ball in turns. Michigan ran 219 plays in the Iowa game, compared to 149 run by Harvard in the Harvard–Yale game of 1901. The fast pace of Michigan's play on offense earned Yost the nickname "Hurry Up." Yost described the 1901 team as a speedy group "composed of muscular, wiry men who had no superfluous weight." The following chart provides a visual depiction of Michigan's lineup during the 1901 season with games started at the position reflected in parenthesis, the chart mimics Yost's short punt formation while on offense, with the quarterback under center. Left guard Dan McGugin married Coach Yost's wife's sister and became a Hall of Fame coach at Vanderbilt. Herbert S. Graver End 1 Chicago, Illinois 5' 9" 157 Eng '04 Englewood H.S. George W. Gregory Center 11 Redding, California 6' 1/2" 188 Law '04 Shasta H.S. Edward W. "John" Dickey Center 0 Weiser, Idaho Law '02. Benjamin H. Southworth Line 0 Reading, Michigan 5'9" 187 Med '03. Trainer Keene Fitzpatrick kept the team fit training in below zero weather and traveling to the Rose Bowl. ^ There is a discrepancy in the historic record as to Michigan's point total in the Albion game. The Bentley Historical Library lists the game score as 55-0. The Detroit Free Press in its next day game account, and The Michigan Alumnus in October 1901 both reflected a game score of 50-0, the box score published in the Detroit Free Press reports nine touchdowns and five goals after touchdown, which would result in a point total of 50. ^ The injury was to Curtis Redden during the Carlisle game, and, according to Yost, Redden "was ready and anxious to play ten minutes after the injury." ^ Birth 25 Sep 1878 in Allens Grove, Walworth Co., Wisconsin; Death 03 Jul 1904 in Delavan Lake, Walworth Co., Wisconsin. ^ "Preussman, the quarterback, has been the whole life of the reserve team. He runs the plays off fast and handles the ball well." 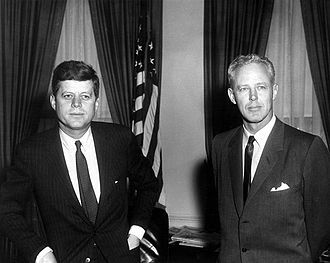 ^ Harry Kent Crafts was the son of Clayton Crafts, the speaker of the Illinois House of Representatives. He attended Northwestern University law school after graduating from Michigan in 1901. He became a lawyer in Chicago. He was married to Verna Louise Harris, June 18, 1903, at Ann Arbor, he was employed for 20 years as the assistant general counsel for Armour & Company. He died December 16, 1939. ^ a b "1900 Football Team". University of Michigan, Bentley Historical Library. Retrieved September 15, 2016. ^ "Lea As Head Coach". The Philadelphia Times. January 20, 1901. p. 10. ^ "Lea To Coach Princeton". Rochester Democrat and Chronicle. January 24, 1901. p. 13. ^ a b c d "Athletics". Michigan Alumnus. October 1901. p. 23. Retrieved 20 March 2010. ^ "Yost Takes Charge at Michigan". Detroit Free Press. April 6, 1901. p. 6. 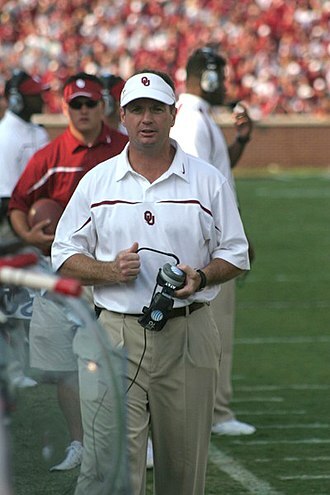 ^ "Coach Yost Expected September 1". Detroit Free Press. August 21, 1901. p. 3. ^ a b "Coach Yost at U. of M." Detroit Free Press. September 5, 1901. p. 3. 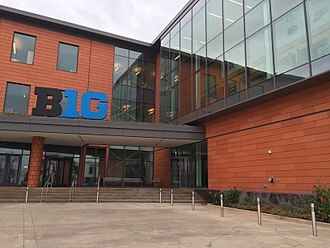 ^ "Michigan Has Hopes: Ann Arbor Institution Expects to Regain Lost Football Laurels". Rochester Democrat and Chronicle. August 31, 1901. p. 15. ^ a b c d e f g h i j Jesse J. Ricks (1901). "Introductory Review". Michigan Daily-News Football Year-Book. Ann Arbor Printing Company. Retrieved 15 March 2010. ^ a b Allison Danzig, The History of American Football, p. 154 (quoting a May 13, 1942, letter from Willie Heston to the author). ^ a b Hugh White (1902). Review of the Season. Michiganensian 1902. p. 130. Retrieved 15 March 2010. ^ "Letters of David Banks '05". The Wolverine. 1901-10-18. p. 8. Retrieved 14 March 2010. ^ 1902 Michiganensian, p. 173. ^ a b c d "Michigan Won By Big Score". Detroit Free Press. November 29, 1901. p. 4. ^ a b c "The Albion Game". Michigan Alumnus. October 1901. p. 24. Retrieved 20 March 2010. ^ a b "Big Score Against Case". Detroit Free Press. October 6, 1901. p. 8. ^ a b c "The Case Game". Michigan Alumnus. October 1901. pp. 24–25. Retrieved 20 March 2010. ^ a b c d e "Michigan Made Grand Showing: Defeated the Heavy Indiana Eleven 33 to 0; Regents Field a Sea of Mud and U. of M. Was Handicapped (part 1)". Detroit Free Press. October 13, 1901. p. 1. ^ a b "Michigan Made Grand Showing: Defeated the Heavy Indiana Eleven 33 to 0; Regents Field a Sea of Mud and U. of M. Was Handicapped (part 2)". Detroit Free Press. October 13, 1901. p. 8. ^ Walter T. Fishleigh (1901-10-18). "Athletics". The Wolverine. p. 5. Retrieved 14 March 2010. ^ a b c "Michigan Rubbed It In: Made Dr. Hollister's Star Eleven Look Cheap; Score 29 to 0 Against a Team Holding Out for More Money (part 1)". Detroit Free Press. October 20, 1901. p. 1. ^ a b c "The Northwestern Game". Michigan Alumnus. November 1901. pp. 79–80. Retrieved 20 March 2010. ^ a b c "Michigan Rubbed It In: Made Dr. Hollister's Star Eleven Look Cheap; Score 29 to 0 Against a Team Holding Out for More Money (part 2)". Detroit Free Press. October 20, 1901. p. 8. ^ a b "Preachers Beaten: Michigan University Battered Northwestern's Football Team". The Pittsburgh Press. 1901-10-21. Retrieved 12 March 2010. ^ a b "Bargain Day In Touchdowns: Michigan Scored 22 Against Buffalo Team (part 1)". Detroit Free Press. October 27, 1901. p. 1. ^ "Bargain Day In Touchdowns: Michigan Scored 22 Against Buffalo Team (part 2)". Detroit Free Press. October 27, 1901. p. 8. ^ a b c "Gridiron Gossip". The Daily Review (Decatur, IL). 1901-10-28. ^ a b "Michigan Made Huge Score; Buffalo Football Team, Conquerors of Columbia, Shut Out by Score of 128 to 0" (PDF). The New York Times. 1901-10-27. Retrieved 12 March 2010. ^ "Coach Yost Known Here: Handler of Michigan's Great Team Lives at Morgantown". The Pittsburgh Press. 1901-10-29. Retrieved 12 March 2010. ^ "Football". Adrian Daily Telegram. 1901-10-28. ^ a b c William Hanford Edwards (1916). Football Days: Memories of the Game and of the Men behind the Ball. p. 292. Retrieved 15 March 2010. ^ a b "Red Men Fell Before U. of M.: Maize and Blue Scored Three Touchdowns and Goal From Field; Carlisle Put Up Great Defensive Game, But Failed To Make a Point (part 1)". Detroit Free Press. November 3, 1901. p. 1. ^ "Red Men Fell Before U. of M.: Maize and Blue Scored Three Touchdowns and Goal From Field; Carlisle Put Up Great Defensive Game, But Failed To Make a Point (part 2)". Detroit Free Press. November 3, 1901. p. 10. ^ a b "Analysis of the Game from the Grand Stand". Detroit Free Press. November 3, 1901. p. 10. ^ a b "Michigan 22, Carlisle 0" (PDF). The New York Times. 1901-11-03. Retrieved 12 March 2010. ^ "Fierce Gridiron Battle To-day". Detroit Free Press. November 2, 1901. p. 1. ^ "Michigan Not In It With Harvard Warner Says". Detroit Free Press. November 3, 1901. p. 10. ^ "Warner Used His Best Team: Carlisle Indians Were As Strong As When They Met Harvard; Michigan In About the Same Class With Crimson". Detroit Free Press. November 4, 1901. p. 8. 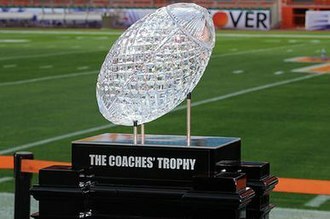 ^ "COLLEGE FOOTBALL GAMES; Records of the Principal Contests Played This Season. U. OF MICHIGAN'S HIGH TOTAL Western Team's Goal Line Not Crossed Once During the Year – Harvard the Champion" (PDF). The New York Times. 1901-11-24. Retrieved 12 March 2010. ^ "Michigan vs. Ohio State". College Football Data Warehouse. David DeLassus. Retrieved September 13, 2016. ^ a b "Michigan Line Is Uncrossed: Only Once Did Ohio Threaten Goal (part 1)". Detroit Free Press. November 10, 1901. p. 1. ^ a b c d "Michigan Line Is Uncrossed (part 2)". Detroit Free Press. November 10, 1901. p. 8. ^ "Michigan Stops Stagg's Tricks: Defeated Chicago by 22–0 Score; "Whoa Back" Did Not Make a Gain (part 1)". Detroit Free Press. November 17, 1901. p. 1. ^ a b c "Michigan Stops Stagg's Tricks (part 2)". Detroit Free Press. November 17, 1901. p. 8. ^ a b "Michigan, 22; Chicago, 0: Annual Game Results in Decisive Defeat of Maroons". Chicago Daily Tribune. November 17, 1901. p. part 3, page 1. ^ "Just Practice For Michigan: Beloit Put Away, 89 to 0, Doubling the Wisconsin Record (part 1)". Detroit Free Press. November 24, 1901. p. 1. ^ "Just Practice For Michigan: Beloit Put Away, 89 to 0, Doubling the Wisconsin Record (part 2)". Detroit Free Press. November 24, 1901. p. 8. ^ a b c d e f g "Michigan 89, Beloit 0" (PDF). The New York Times. 1901-11-24. Retrieved 12 March 2010. ^ "Hurrah for Michigan, Champion Football Team of the West! U. of M.'s Goal Undefiled; Wolverines Scored Almost At Will Against the Hawkeyes, 50 to 0". Detroit Free Press. November 29, 1901. p. 8. ^ a b c "Michigan 50, Iowa 0" (PDF). The New York Times. 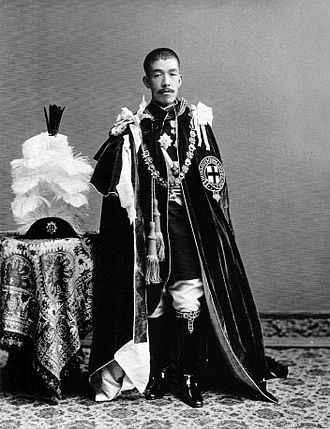 1901-11-29. Retrieved 12 March 2010. ^ "1902 Rose Bowl". University of Michigan. Retrieved 18 March 2010. ^ "Rose Bowl Game". Tournament of Roses. Archived from the original on 18 July 2007. Retrieved 18 March 2010. ^ a b Allison Danzig (1956). "10: An Era of Yost, Stagg, and Thorpe". The History of American Football. Prentice-Hall, Inc. p. 153=154. ^ "Goals from the Field". Detroit Free Press. November 2, 1901. p. 10. ^ "Scored Over a Point to the Minute". Detroit Free Press. November 4, 1901. p. 8. ^ "U. of M." Detroit Free Press. December 1, 1901. p. part II, p. 5. ^ a b Hugh White, Review of the Season, p. 131. ^ Caspar Whitney (1902). "The Sportsman's View-Point" (PDF). The Outing Magazine. Retrieved 14 March 2010. ^ "The Middle Western Football Season" (PDF). The Outing Magazine. 1902. p. 501. Retrieved 14 March 2010. ^ "Walter Camp's All-Western Team". Michigan Alumnus. January 1902. p. 179. Retrieved 20 March 2010. ^ a b c Yost's Soliloquy. Michiganensian 1902. 1902. p. 132. Retrieved 15 March 2010. ^ "Football M's for 1901". The Michigan Alumnus. December 1901. p. 133. Retrieved 17 February 2012. ^ a b Jesse J. Ricks (1901). The Michigan Daily-News Football Year-Book. Ann Arbor Printing Company. The Michigan Wolverines football program represents the University of Michigan in college football at the NCAA Division I Football Bowl Subdivision level. Michigan has the most all-time wins and the highest winning percentage in college football history, Michigan began competing in intercollegiate football in 1879. The Wolverines joined the Big Ten Conference at its inception in 1896, Michigan has won or shared 42 league titles, since the inception of the AP Poll in 1936, has finished in the top 10 a total of 37 times. The Wolverines claim 11 national championships, most recently that of the 1997 squad voted atop the final AP Poll. From 1900 to 1989, Michigan was led by a series of nine head coaches, Fielding H. Fritz Crisler brought his winged helmet from Princeton University in 1938 and led the 1947 Wolverines to a national title and Michigans second Rose Bowl win. Bo Schembechler coached the team for 21 seasons in which he won 13 Big Ten titles and 194 games, a program record. 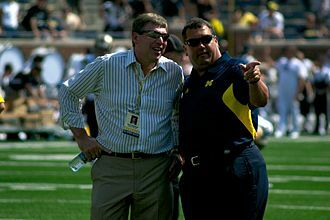 Following Schembechlers retirement, the program was coached by two of his assistants, Gary Moeller and Lloyd Carr, who maintained the programs overall success over the next 18 years. However, the programs fortunes declined under the two coaches, Rich Rodriguez and Brady Hoke, who were both fired after relatively short tenures. Following Hokes dismissal, Michigan hired Jim Harbaugh on December 30,2014, Harbaugh is a former quarterback of the team, having played for Michigan between 1982 and 1986 under Schembechler. The Michigan Wolverines have featured 78 players that have garnered consensus selection to the College Football All-America Team, Three Wolverines have won the Heisman Trophy, Tom Harmon in 1940, Desmond Howard in 1991, and Charles Woodson in 1997. Gerald Ford, who would become the 38th President of the United States. On May 30,1879, Michigan played its first intercollegiate game against Racine College at White Stocking Park in Chicago. The Chicago Tribune called it the first rugby-football game to be played west of the Alleghenies, midway through the first inning, Irving Kane Pond scored the first touchdown for Michigan. According to Will Perrys history of Michigan football, the crowd responded to Ponds plays with cheers of Pond Forever, in 1881, Michigan played against Harvard in Boston. The short punt formation is an older formation on both offense and defense in American football, popular when scoring was harder and a good punt was itself an offensive weapon. In times when punting on second and third down was fairly common, teams would line up in the short punt formation and offer the triple threat of punt, harpers Weekly in 1915 called it the most valuable formation known to football. The formation is similar to the wing and modern shotgun by including the possibility of a long snap from center. However, it is generally a balanced formation, and there are backs on both sides of the tailback, offering better pass protection, as a result, it was considered a much better passing formation than running, as the premiere running formation was the single wing. That said, it was regarded as a formation for trap plays The formation was invented by Amos Alonzo Stagg in 1896. Andy Smith, coach of Californias Wonder Teams summed up the short-punt philosophy with his motto of Kick, in the early days of the sport the ball was often moved up the field, not through offensive plays, but rather through punting. Albion College is a private liberal arts college located in Albion, Michigan. Affiliated with the United Methodist Church, it was founded in 1835 and was the first private college in Michigan to have a chapter of Phi Beta Kappa and its student population during the 2013-14 academic year was approx. The Colleges athletic teams are nicknamed the Britons and their colors are purple and they participate in NCAA Division III and the Michigan Intercollegiate Athletic Association. Albion College is a member of the Great Lakes Colleges Association and the Michigan Campus Compact, U. S. News includes a high school counselor ranking, in which Albion placed 85th among national liberal arts colleges. The origin of Albion College lies not in the city of Albion, on March 23,1835, Methodist Episcopal settlers in Spring Arbor Township obtained a charter for the Spring Arbor Seminary from the Michigan Territorial Legislature. No classes were held at the Spring Arbor location. The trustees applied to move the seminary to Albion in 1838, with 60 acres of land donated by Albion pioneer Jesse Crowell, the cornerstone was laid for the first building in 1841. The seminary, now named the Wesleyan Seminary, first held classes in 1843, in 1844, classes began in the newly constructed Central Building, which was rebuilt as the present Robinson Hall in 1907. The Albion Female Collegiate Institute was founded in 1850 by the Wesleyan Seminary Corporation, the two schools merged in 1857 under the name The Wesleyan Seminary and Female College at Albion. The Albion College student body is composed of approximately 1,500 students, the average class size of under 19 is comparable to other small liberal arts colleges. Albion College employs more than 100 full-time faculty, of more than 95% have earned the highest degree offered in their field. Albion College appears on the U. S. News & World Report list of Americas Top Liberal Arts Colleges, Albion is a member of The Princeton Reviews 376 Best Colleges and Best Midwestern Colleges list. Albion College offers approximately 30 academic majors leading to Bachelor of Arts, in addition to the academic majors, numerous concentrations, academic institutes, and special programs are offered. The Case Western Reserve Spartans football team is the varsity intercollegiate football team representing the Case Western Reserve University, located in Cleveland, United States. They compete in the National Collegiate Athletic Association at the Division III level and they are coached by Greg Debeljak. Home games are played at DiSanto Field, the team in its current form was created in 1970 after the federation of Western Reserve University and Case Institute of Technology. Case, originally known as Case School of Applied Science, carried the name Scientists from 1918–1939, in 1940, the mascot was changed to the Rough Riders, in honor of their head coach Ray A. Ride. Case formally updated their name in 1947 to Case Institute of Technology. Western Reserve originally used the mascot Pioneers from 1921–1927, until being forced to change by Marietta College, the famous Red Cats mascot was used beginning in 1928. Upon the merger of the two schools, the Spartans name was adopted in 1970, as the team is now presently known, Western Reserve played its first season in 1890 and Case began the following year in 1891. Physically bordering each other, the two became instant rivals. From 1894–1953, the game was played mostly on Thanksgiving Day. Due to high civic interest and large crowds, the games were held at larger Cleveland city venues, such as League Park. Western Reserve led the all-time series 49–20–5, in 1892, Western Reserve declined Clevelander John Heismans offer to be their head coach, and ironically faced him and his Oberlin Yeomen during the season opener, getting destroyed 38–8. Western Reserve would have their two years in 1894, finally defeating Heisman while at home in Cleveland, ending the season with a 7–0 undefeated record. In fact, the team outscored opponents a combined 232–8, only Oberlin and Ohio State scored on Western Reserve that year. The 1902 team scored the first touchdown against Michigans legendary coach Fielding H. Yost, in fact, the headline in the Detroit Free Press referred not to Michigans victory but instead read, MICHIGANS GOAL LINE CROSSED. Western Reserve emerged to win titles in both 1907 and 1908, and again in 1915. Camps 1901 All-America Team was published in Colliers Weekly, and Whitneys selections were published in Outing magazine. In its official listing of Consensus All-America Selections, the NCAA designates players who were selected by either Camp or Whitney as consensus All-Americans, using this criteria, the NCAA recognizes 18 players as consensus All-American for the 1901 football season. John J. Pershing during World War I, inspector general of the New York National Guard, and as a member of the Harbord Commission, Paul Bunker, a tackle for Army whose posthumously published account of his time as a Japanese prisoner of war became a best-seller. A portion of the U. S. flag flown at Corregidor was saved from burning by Bunker and kept hidden as a patch inside his shirt, Dave Campbell, an end for Harvard who was inducted into the College Football Hall of Fame in 1958. Charles Dudley Daly, a quarterback for Harvard who was inducted into the College Football Hall of Fame in 1951, in 2008, Sports Illustrated sought to answer the question, Who would have won the Heisman from 1900-1934. Its selection for 1901 was Daly of Army, a player who put on a one-man show against Navy, bill Morley, a halfback for Columbia who was inducted into the College Football Hall of Fame in 1971. He became a prominent cattle and sheep rancher in New Mexico, Neil Snow, an end for Michigan who scored five touchdowns in the 1902 Rose Bowl and was inducted into the College Football Hall of Fame in 1960. Bill Warner, a guard for Cornell who was inducted into the College Football Hall of Fame in 1971, Warner served as the head football coach at Cornell, North Carolina, Colgate, St. Louis, and Oregon. Harold Weekes, a halfback for Columbia who was inducted into the College Football Hall of Fame in 1954, the All-America selections by Camp and Whitney were dominated by players from the East and the Ivy League in particular. In 1901,17 of the 18 consensus All-Americans came from Eastern universities, the undefeated Harvard Crimson team had eight players who were designated as consensus All-Americans. The only four consensus All-Americans from schools outside the Ivy League were Neil Snow of Michigan, Paul Bunker and Charles Dudley Daly of Army, and Walter Bachman of Lafayette. The Buffalo Bulls football program is the intercollegiate American football team for the State University of New York at Buffalo located in the U. S. state of New York. The team competes at the NCAA Division I level in the Football Bowl Subdivision and is a member of the Mid-American Conference, Buffalos first football team was fielded in 1894. The team plays its games at the 31, 000+ seat UB Stadium on University at Buffalos north campus in Amherst. The Bulls are coached by Lance Leipold, UBs first run with football started in 1894 and lasted until 1970, when the football program was suspended due to the student bodys vote to stop funding the program. The football program was reintroduced in 1977, when reintroduced, the team played in Division III level football until 1992. In 1993, the made the jump to Division I-AA. In 1999, the Bulls moved up again to Division I-A Bowl Subdivision level football, in 1894, UB established an athletics association and fourteen UB Medical students formed the first UB football team. By 1896, they were a force in Western New York football playing collegiate and club teams. In 1897, C. W. Dibble coached UB to a perfect 7–0–0 record beating Syracuse twice, in 1899, Bemus Pierce coached UB to a 6–0 record. In 1900, Buffalo beat Penn State 10–0, in 1901, former player James B. Turk Gordon coached the UB team to a 4–2 record, in 1903, Ray Turnbull led the UB team to a 3–3 record. After the 1903 season, UB would not again put a team on the field until 1915, in 1915, UB re-established the football program and officially instituted mens basketball. Both teams were named the Bisons and used as their logo a caricature of a male American bison, Frank Mount Pleasant was called on to coach the football team but was replaced the following season after a 3–4 record. Art Powell would take over in 1916 and coach the team for six seasons, in 1920, UB would start playing on what would eventually be called Rotary Field. UB would go through two coaches in a span of two years – Dim Batterson in 1922 and James Bond in 1923 – before Russ Carrick would take over, serving five seasons despite winning only five games. Drew Willy scrambles against Bowling Green in 2005. Guard Dan McGugin later gained fame as Vanderbilt's coach. Michigan vs Case series occurred from 1894–1923, where Michigan hosted Case in sixteen home openers. Ohio State vs Case 11/9/1918. Military images were common on football programs during World War I. Western Reserve won its first of eight Big Four Conference titles in 1934. With halfback Willie Heston in the backfield, the Michigan Wolverines compiled a 43–0–1 record between 1901–04.